This Black Leopard SFX library was recorded by our sound recordists in Thailand in 192 kHz, 24-bit WAV format. It includes a huge variety of sounds from groans, growls, sniffs, roars and everything in-between, recorded at a pristine audio quality. If you’re looking for a definitive library for the Black Leopard for film, game audio or sound design, this is the library for you! 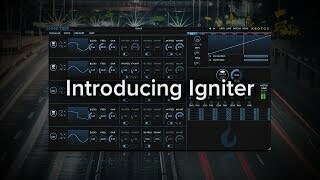 Igniter is the new industry standard for creating any real-world or sci-fi vehicle and engine sound effects with ease. Whether you work in audio post or game audio, Igniter enables you to design, perform and automate any complex vehicle behaviour directly in your DAW – from sports cars, motorbikes, planes, helicopters, spacecraft and other engine sounds to moving ambiences, textures, Foley or whatever sparks your imagination. Igniter is the only solution of its kind to come jam-packed with over 20 performable vehicles and 614 audio assets from vehicles including Aston Martin, Ferrari, Porsche, Tesla, Harley Davidson, Huey UH-1H, Agusta Westland 119x, CH-47D Chinook, Bombardier Challenger, Cessna 560XL, skids, sweeteners and much more. Recordings come from Watson Wu, The Recordist, Sounding Sweet, George Vlad, Echo Peak and Flysound. Igniter is the new industry standard for creating any real-world or sci-fi vehicle and engine sound effects with ease and at unbeatable value. Whether you work in audio post or game audio, Igniter enables you to design, perform and automate any complex vehicle behaviour directly in your DAW – from sports cars, motorbikes, planes, helicopters, spacecraft and other engine sounds to moving ambiences, textures, Foley or whatever sparks your imagination. Igniter is the only solution of its kind to come jam-packed with over 20 performable vehicles and 1,943 audio assets from vehicles including Aston Martin, Ferrari, Porsche, Tesla, Harley Davidson, Huey UH-1H, Agusta Westland 119x, CH-47D Chinook, Bombardier Challenger, Cessna 560XL, skids, sweeteners and much more. Recordings come from Watson Wu, The Recordist, Sounding Sweet, George Vlad, Echo Peak and Flysound. For vehicle fanatics, Igniter Full Tank comes with 75GB of additional library content including onboard recordings, ramps & static rev bands, Foley sounds, skids, slides and much more!